The Israeli Air Force fired, on Sunday at dawn, at least one missile into an area, north of Beit Lahia, in the northern part of the Gaza Strip, causing damage. The missile caused damage to the targeted site, believed to be run by the al-Qassam Brigades, the armed wing of Hamas, causing damage to it, a few surrounding homes and property, and led to anxiety attacks among many children. In a statement, the Israeli army said it targeted the Hamas position in response to incendiary kites, set by Palestinian protesters into lands across the border fence. 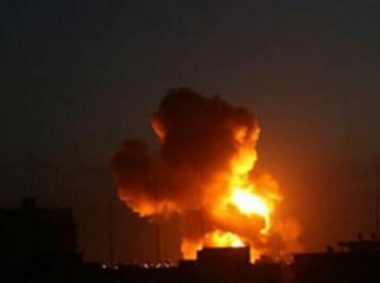 The army added that the latest attack had no relation with the Saturday explosion, which claimed the lives of six Palestinian fighters in Deir al-Balah, in central Gaza. It also held Hamas responsible for any further escalation and the consequences of any attack from the Gaza Strip. It added that Palestinian protesters managed to down two military surveillance drones using slingshots, and quoted the army claiming the drones, Phantom 3 and Matrice, are surveillance only UAV’s and do not carry classified intelligence.